Hummus. That simple dish of chickpeas blended with a little tahini, lemon juice, garlic and salt, that somehow manages to have the allure of something much grander. The debate over hummus is ongoing, from where in the Middle East it originated to how it should be prepared and eaten. Chunky or smooth? Warm or room temperature? Blended with or without olive oil? Served as is or with a topping? I would like to stop for a second and take a breath from the many variations out there, and give you a simple recipe for the hummus I made for lunch today. This came about from not knowing what to make, and after a quick brain rumage of what was in the cupboard I decided I needed to get my hummus on! I realise from past experiences that hummus can be really expensive depending on where you buy it from. Criminal, since it’s generally a very cost efficient thing to make. Since it came to me as a bit of a last minute idea, I made it with a tin of chickpeas instead of going through the whole dried chickpea soaking process. This made it incredibly fast to whip up and took very little work on my part. What I did do, however, was pinch those bad boys out of their little white jackets. I felt in the mood for a nice smooth dip today, so the skins were happily discarded! This is the first time I’ve ever been so precious over a bowl of hummus, but I must say, it was definitely worth the extra smidge of effort and it really didn’t take much time at all. Either way, consider it a labour of love! The silky smoothness was a lovely change from the coarser stuff I’ve become accustomed to, so give it a go and see which way you prefer! Place the chickpeas into the bowl of a food processor, reserving a small handful for sprinkling over at the end, and blend to a stiff paste. With the machine still running, add the tahini, lemon juice, garlic and a generous pinch of salt. Add the water in a slow, steady stream, blending until you have a very smooth and creamy paste. Cover the surface with clingfilm and leave to rest for about 30 minutes. In the meantime, preheat the oven to 200 C.
Cut the pitta bread in half, then into wedges. Put them on a baking tray and coat generously in olive oil, salt, pepper and any other spices you might want. I put cumin seeds on mine, as well as a some Japanese shichimi for a slight kick of heat. Put them in the oven for about 15-20 minutes, or until golden brown. Top the hummus with a healthy dose of extra vigin olive oil, the remaining chickpeas, some fresh thyme leaves and a small tomato chopped up. Sprinkle with a pinch of salt and some deliciously tangy sumac if you have it. Now, go and have a tasty lunch and enjoy! • Hummus is such a super food. A ‘superfood’ in the health kick sense of the word, yes, but really, even more literal than that. It is a super. food. SUPER! I kid you not. It’s cheap and cheerful, tastes wonderful, is satisfyingly filling, healthy and a snap to make. Try to use nice large, soft chickpeas for this. After years of trying different brands from various places, I’ve come to the conclusion that ones you get in Asian supermarkets tend to be vastly superior. Don’t get me wrong, they cost very little, actually probably much less than those from the major supermarkets but the difference in texture is phenominal. Deliciously soft and yielding as opposed to small, hard pellets that are not a pleasure to eat at all! What is that all about?! Also, bear in mind that these toppings are completely optional. It will still be really tasty with nothing but a splash of olive oil on top! I like to serve some raw veggies on the side too, such as nice fresh carrot sticks or pieces of cucumber with the seeds removed to dip into the remaining hummus. I remember a couple of years ago reading a wonderful article Yotam Ottolenghi wrote for The Guardian’s Word of Mouth blog called ‘The Perfect Hummus Debate‘, where he goes into more detail about this little wonder of the culinary world! If you’re interested in a little extra light reading, this is well worth a look at. 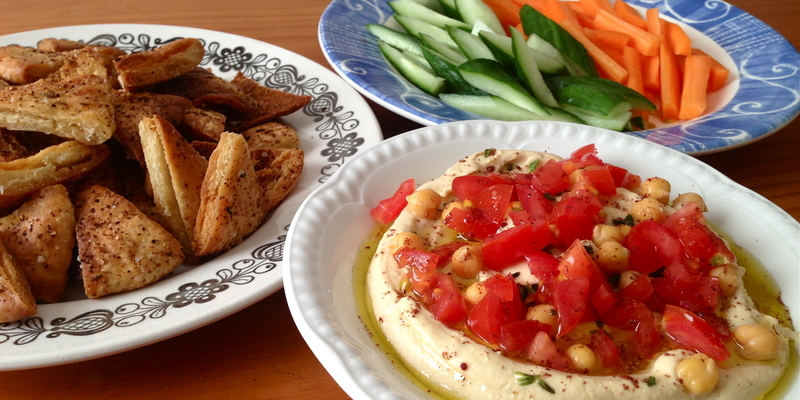 Especially if you want a lovely recipe for hummus with ful, and who in their right mind wouldn’t? !